I know, I know... you know that I love Mexican flavors. Is every other post in this blog inspired by Mexican ingredients and flavors? Maybe, but there's nothing wrong with that. I had several peppers to use up as well as some chicken, so instead of doing a stir fry with Asian spices and flavors, I decided to make this one Mexican. I made it up as I went along. 1/4 c chunky salsa1 each different color peppers, sliced. I used yellow, orange, red, and green. Add onions and garlic, saute 1 min and push to sides of pan. Add all of the peppers and let cook for about 5 minutes. Add chicken broth, cilantro, spices (if desired), lower heat and cover. Let simmer for about 10 minutes. Serve over rice. This would also be good in a tortilla! Cilantro is one of my favorite herbs and I enjoy finding different uses for it. Although this dish had some kick from all of the spices and jalapenos, the addition of cilantro and lime juice gave it a cool, fresh taste that evened out the heat. Jon loved this - he had two plates. 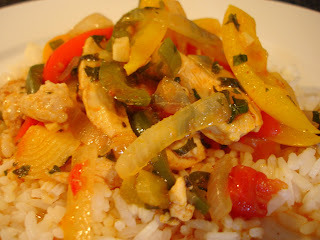 I loved it as well - it's light and fresh tasting, healthy (in my opinion), so easy to make, and the aromas alone during cooking make it worth making! 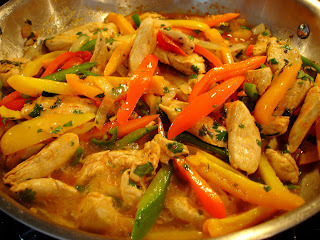 This reminds me of my MIL's fajita stir fry that she serves over rice... and it's so good! She made it for dinner during the time I started dating my husband and met the family. Thanks for posting this and taking me back to when I first met my MIL.